Deepika Padukone and Ranbeer Singh's picture-perfect wedding in Italy left their fans go 'aww' for the cutest Bollywood couple! 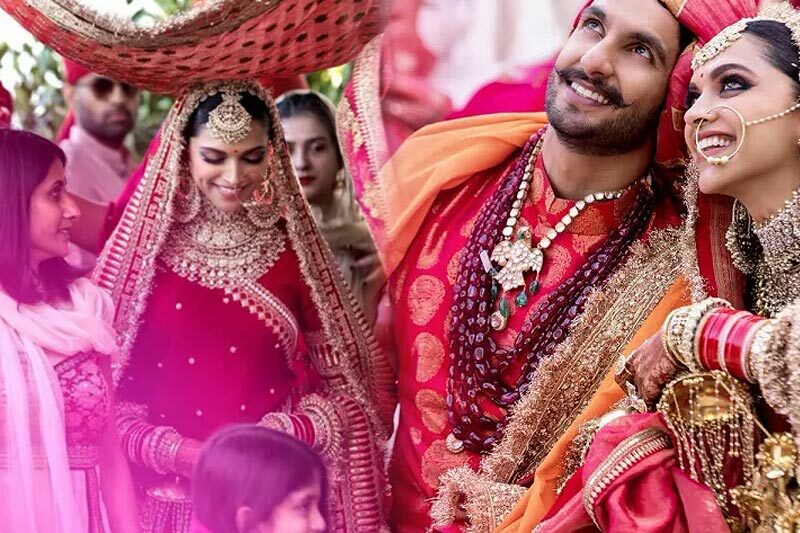 Deepika's dreamy and dramatic bridal looks from various nuptial ceremonies including her Konkani wedding to Bengaluru reception left everyone swooning. As Deepika gave brides-to-be major fashion goals, here we offer glimpses to her stunning outfits for those seeking wedding outfit inspiration. For her mehendi ceremony that took place against the backdrop of Lake Como, Deepika adorned blush pink ensemble. It was teamed with a red dupatta that was lending the bridal vibes to her overall look. Traditional jewellery, hair tied in a bun, minimal makeup and a sweet smile completed her gorgeous look. On your mehendi ceremony, be a sight to behold in this navy blue lehenga choli from Like A Diva. For her Konkani wedding, Deepika slipped into a regal red and gold silk saree. Heavy bridal jewellery was balanced with neutral make-up with earthy tones. Every soon-to-be-bride must be crushing on this look! Padmaavat actress looked no less than a royal bride during the Sindhi wedding ceremony. She donned ravishing red lehenga choli embellished with gold details. Red chooda and kalire completed her dreamy bridal look. Be the head-turning bride in this raspberry red lehenga choli embellished with floral zari and sequins work! For a Konkani wedding ritual, Deepika slipped into a beige suit. Her hair tied in a sleek bun and adorned with gajra, lent her an elegant and classy look. The flattering silhouette of this floor-length red anarkali suit is accentuated with rich zari embroidery and stone work. It’s perfect for various wedding ceremonies. The pretty bride returned to India and was seen sporting a newly-wed look in a beige churidar suit teamed with red silk dupatta. Sindoor, henna, and happiness completed her look! As the new bride, you can slip into this pale tangerine embroidered salwar suit in digital print cotton-silk with pants and Banarasi weave dupatta. Complete the look with a pair of jutis and traditional jewellery. DeepVeer's Bengaluru reception at Leela Palace saw the golden girl draped in an awe-inspiring golden saree. Neat bun adorned with gajra, earthy make-up, emerald and pearl jewellery teamed with a perfect bridal glow completed her look. D P slayed it in the post-wedding party too! The new bride adorned a striking floral lehenga with pink and red rose motifs. Dark-kohl eyes, statement neckpiece and a classy hair-updo with a red rose headband completed her look. The party was thrown by Ranveer Singh's sister Ritika Bhavnani in Mumbai. You too can slay it in this chic back trail anarkali with raw silk lehenga in powder pink net with zari embroidery. Accessorise your look with a floral head piece, you can add feathers for over the top look new bride look! Please enter code you see above in the box below to validate this form. Copyright © 2019 Like A Diva.